Ranbir Kapoor wants to cast Khans of Bollywood in a short film ! 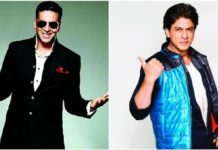 Ranbir Kapoor wants to cast the Khans of Bollywood in a short film ! It was surprising to hear this from Ranbir as he doesn’t share a good rapport with the Khans especially Salman Khan as we all know because of Ranbir’s affair with Katrina who is Salman’s ex. It will be quite interesting to see what the iconic Khans of Bollywood reply when asked if they would work together in Ranbir’s short film! Ranbir is currently shooting for Imtiaz Ali’s next Tamasha along with ex-flame Deepika Padukone. The first scheduled of the film is already over. Ranbir will soon start shooting for Jagga Jasoos co-starring his lady-love Katrina Kaif.